This quilt reflects on my early morning quiet time, when I gather my thoughts for the day ahead. 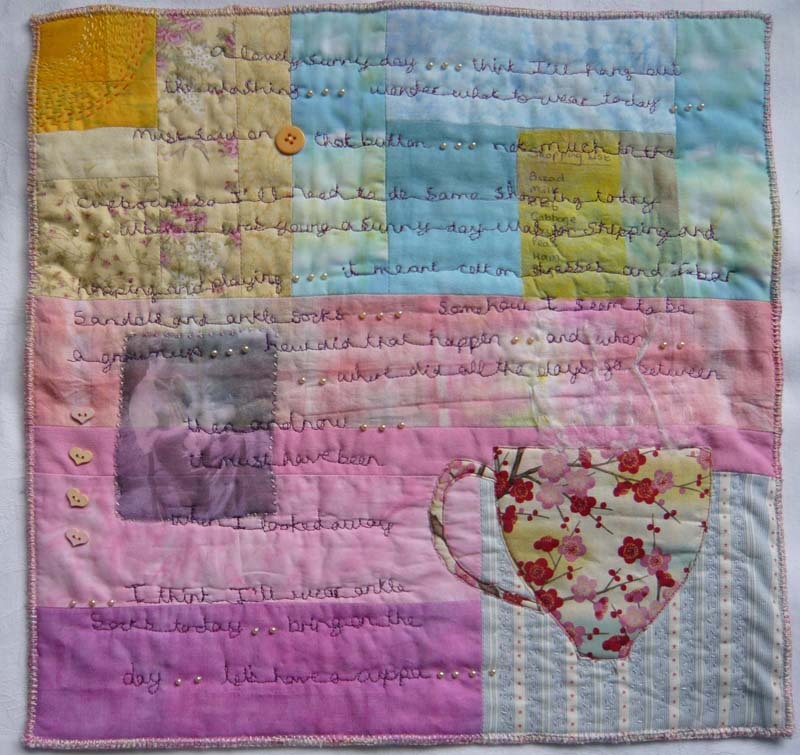 The background is loosely based on a log cabin design, with the ‘centre’ being the top left hand corner, where a running stitch circle represents sunshine. In the opposite, bottom left hand corner of the quilt I have added an applique cup of tea, which usually is my cue to get on with the rest of the day! The fabrics are mainly hand dyed with a few commercial patterned pieces, where I feel they are needed and that they work. 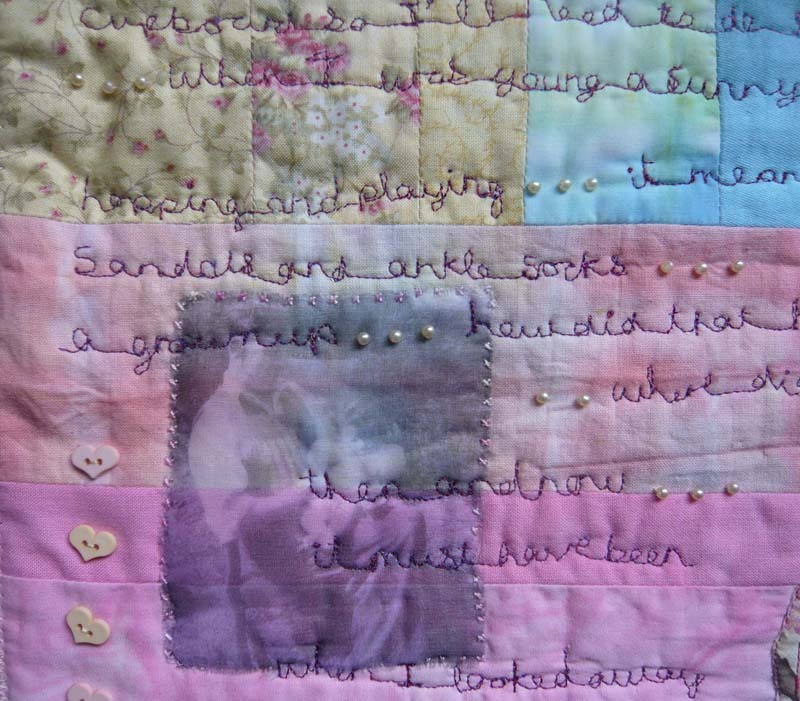 I used the words of my thoughts as the quilting pattern. These are not in straight lines or too neat, which exactly matches how haphazard and random my thoughts are. I would like to say that this was intentional, but it’s more a product of my untidy handwriting and not-so-hot free machining skills. However, having said that, I didn’t want to correct it, because I like how it ended up. I hope that these are self explanatory, and my printed photo image of myself as a baby with my father is meant to be a point of reference for the text. Great interpretation of the theme. Love the way you incorporated your dad and the cup of coffee as well as the stitching of the thoughts. I write “Morning Pages” (a la Julia Cameron) every day…gathering my thoughts as you do. A wonderful interpretation of “my” journal! Hi Joan, I have not had time to comment, but here are my thoughts, I like the soft use of the primary colours to indicate early morning, I usually take photographs of our sunrises and have seen these colours when it is not going to be a hot day. 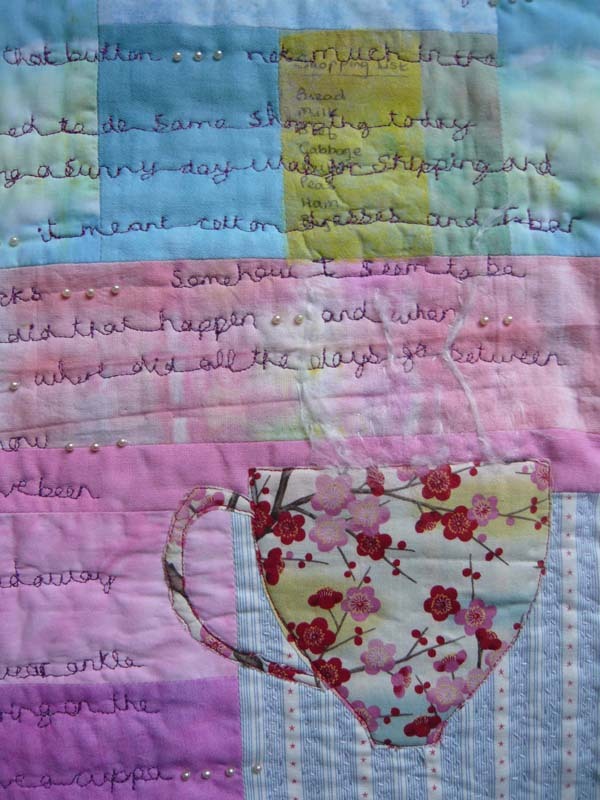 The writing adds a lot of character to your quilt and the coffee cup makes a viewer look to see what else is happening. The yellow takes the viewers eyes on a trip up to the yellow sun (great idea).